Weekend Eats: A Healthy Brunch Recipe the Whole Family Will Love! It’s Thursday, which means we’ve all started to flesh out our plans for the upcoming weekend. The anticipation is so sweet, isn’t it? Slowing down, sleeping in, and letting the stresses of the work week melt away. We can’t think of a better compliment to a lazy Saturday morning at home with the family than a healthy and delicious brunch. Because let’s face it, the best brunch recipes require a little more TLC than we can muster on a busy weekday morning. We love gathering around the kitchen table for a big brunch each weekend, but we also aim for a mid-day meal that will keep us going all afternoon and won’t bust our calorie budget. Below is a fantastic recipe from Shape magazine for Blueberry Banana Pancakes that make a fantastic weekend treat, and shhh…they’re healthy too. Don’t tell the kids! Preheat oven to 250 degrees F. Coat a griddle or large nonstick skillet with cooking spray and preheat. In a medium bowl, combine both flours, sugar, baking powder and salt. Mix well with a fork and set aside. In a large bowl or food processor, mash bananas until mushy. Add milk, egg and vanilla and mix or process until blended. Add dry ingredients to banana mixture and mix or process until just blended (tiny lumps should still appear; do not overmix or pancakes will be tough). Ladle 3 tablespoons of banana pancakes batter onto hot griddle for eachpancake. Top each with ½ tablespoons of blueberries. When bubbles appear around the edges of the banana blueberry pancakes, after about 2-3 minutes, flip and cook 1 minute. Transfer the banana blueberry pancakes to a warm plate and keep warm in a 250 degree F oven while you cook remaining pancakes. 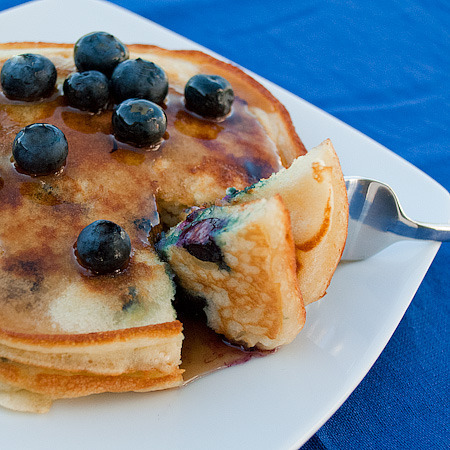 Serve the healthy banana blueberry pancakes with maple syrup over top. We love that this recipe incorporates frozen blueberries, which are often much cheaper than fresh and available year-round. The whole wheat flour and fruit really bumps up the fiber content, making these pancakes much more filling than your traditional flapjacks. Make these this weekend, and love them as much as we do! We love websites like www.shape.com and www.realsimple.com for cheap, easy, and nutritious recipes that are great for feeding two, or ten! For all your nutrition needs, be sure to check out the Academy of Nutrition and Dietetics website at www.eatright.org. If you’d like Family Food, LLC to help you design a healthy eating plan for your family, feel free to call, e-mail, or leave a message on Facebook or Twitter. We’re always here to help, and better yet, your insurance plan could entitle you to SIX FREE VISITSwith our expert team of registered dietitians! Valentine’s Day Treats: Feel the Love, Not the Guilt!